PSYCHIC TAROT: Accurate, honest readings. One of KEEN's most popular tarot readers with over 60,000 readings. Serious , honest answers to your questions , given accurately and quickly. PLEASE no general readings by chat or phone. I'm here to help. I am a born psychic who is mostly claircognizant. PLEASE bring a question, "NO general readings" please! I answer your questions, and I don't ask any. I am NOT a timing expert, and timing is the most changeable part of a reading, so I will give time frames when they are given to me, please don't just ask for "when" . I have given over 63, 000 Keen readings, and even more outside of KEEN at bookstores, metaphysical shops, etc. I only work in the light. I will not tell you I am 100% accurate, no one is, and we ALL have free will, that can change any reading. I am currently studying mediumship with a world famous Medium. My approach is simple, I need your question (not a topic), and sometimes the person's first name. This triggers my claircognizant abilities. Please have your question ready. I ALWAYS will answer your question, you may not like the answer, but I will ALWAYS give you an answer, not sure about the reading or answer, email me and I will clarify for you. I will tell you the truth, so make sure you are ready. I do "NOT do general" readings by phone or chat. NO pregnancy, no lottery, no health diagnosis questions! Please do not ask me to find your lost objects. My view of things is close up and hard to distinguish exactly where they are. I am straight up with you and expect you to be with me. I do NOT ask you questions except a name. I am here to help, and I cannot do that by lying to you, so you will hear the truth, although I deliver it in a gentle way. I use my method of card reading not layouts in books, I have been using this method for over 49 years! I read quickly, accurately, and use a combination of the cards and my psychic abilities. I am straight up and honest with you, and expect you to be with me. I will help you with affirmations that I write specifically for you and your situation at the end of a reading, but please email and request this. I am signed on EVERY day from 5:30/5:45 AM to 8:45/9PM Central and on weekends 7AM (or earlier sometimes) to 8:45/9PM Central. I do take breaks for a walk, meals etc. Please arrange a call when I am not on. Readers are talking to Spirit, and please respect that connection. PLEASE do not ask for a health diagnosis (including pregnancy), lottery, what stocks to buy, these are not allowed by KEEN. ALWAYS awesome. Love you Girl! thank you Miss Gina! great insights and reading! I have been consulting Gina for years. Always accurate, to the point, will not tell you what you want to hear though. She gives answers, reasons, time frames. Accurate, professional, talented and above all....HONEST. Thanks Gina, you have taken some worry off my shoulders...again. very vague. would not directly anawer my questioms. I have no idea how others got such great readings. This was a waste of money for me. Welcome to my page!!! I am Gina, TripleMoonGoddess! Triple Moon Goddess is here to help, to deliver messages from a Higher Power Accurate, quick , experienced and affordable. No time wasting tricks! Quick answers to your questions! 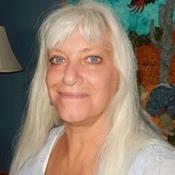 Over 49 years experience giving readings, from a born psychic. Truthful answers, on any subject, from an experienced, talented and non-judgmental reader! Call, chat, email readings all available to you. Please note: I ONLY do general readings by E-MAIL, not by phone or chat! I do not send free minutes on request, I don't think that is fair to my other clients!! When you have a question or problem with your reading, EMAIL ME! I will try to clarify for you. I am here to give you accurate and honest information without wasting your time! I am always truthful, so be ready! The truth will help you, fairy tales leave you stuck. I will also tell you that no reader is 100% correct and messages are what you NEED to hear. Spirit sends messages to help you, and sometimes that is through uncomfortable situations. I am the "real deal", psychic since birth. I was given tarot cards to help focus my messages at age 10. I won't tell you I am "world famous", nor "the best" (God knows who that is!). I won't promise to repair your relationship, BUT if it IS repairable we will find the answer HOW, if not, I will let you know , so that you do not waste your time and move on to happiness! I WILL tell you that I will be honest with you. I not only read tarot but TEACH tarot and have sent many out to practice the art of tarot. I WILL tell you that I am accurate. I WILL tell you the truth (good or bad), and I have been doing this successfully for over 49 years! I WILL tell you how to be more successful! I WILL tell you that if you need some clarity on what I told you during your reading, email me after the reading and I will clarify what we talked about. I WILL tell you I am quick and do not use any time wasting tricks like minutes of noisy shuffling or "connecting". Bring your questions (they trigger my claircognizant abilities)! No birth dates please, I don't need to know your age, or other clues, I work only from messages from Spirit! Spirit doesn't tell you what you want to know, but what you NEED to know. I will give you TIME FRAMES, but please realize that timing is the most changeable part of any reading.The first questions should never be "when", but rather "if" or "what". Be in a place where I can hear you and you have the privacy to take the call , or use the chat feature. Don't kill the messenger! I am polite, respectful and caring to you, and your situation. I am non-judgmental and caring. I expect the same in return, but I WILL pass on all the messages spirit sends, good or bad! Tarot is all about giving you CHOICES. All of your life is NOT preordained, VERY LITTLE actually is, and those circumstances involve learning life lessons/growth, and Karma. Even those can sometimes be changed with work and willingness to change. 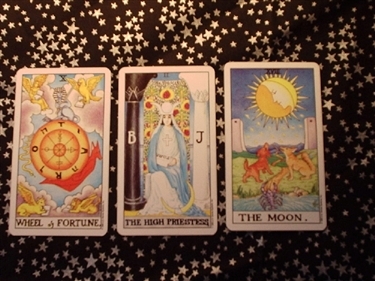 A tarot reading shows you the best paths and choices that are available to you right now. The cards are so valuable in making decisions because they are never wrong, they are not a product of the reader, but a higher power. The key is to find experienced readers who can pull all the messages out quickly and accurately. I have this experience, plus psychic ability. I am here to help people achieve and grow. That is my goal, so I will be honest with you, not tell you what you want to hear, and I will give you information that is important for you to know. YOU can change the result in some circumstances, others you cannot, the cards distinguish between the two. This is why tarot is so wonderful in helping us make life choices! I am claircognizant (clear knowing), clairsentient (clear feeling), clairaudient (clear hearing) and an empath, and able to obtain answers quickly. I give details and time frames, the longer your call, the more information you will receive. I don't try to sell you anything extra, I just give you information that is valuable in making your life decisions! My strongest aspect is people and their motivations and actions. Please make sure you are in a good place emotionally, mentally, and even physically. I do NOT do general readings by phone, general email readings are sent "Pay to view", and are $49, single subject email are $39. PLEASE do not email for free readings. TripleMoonGoddess has been a user of Keen since 2004. Getting Tarot Readers advice from TripleMoonGoddess through www.keen.com is safe, secure and confidential. Since its inception in 1999, Keen has been a trusted, reliable resource for personal live advice. Today, Keen is a leading Psychic Readings community for live, immediate advice and insights. Connect via phone, chat or email - anytime, anywhere. New customers get a free three minute Psychic Readings trial when joining. © 2019 Ingenio, LLC. All rights reserved.